It was a beautiful morning in Myrtleville: temps were 7.8c in the water and -2c on land with lovely sunshine. The beach was icy, admittedly and that wasn’t the most pleasant for the feet! Still, a great turnout of eight swimmers, even if some promised special guests couldn’t make it after a late night. 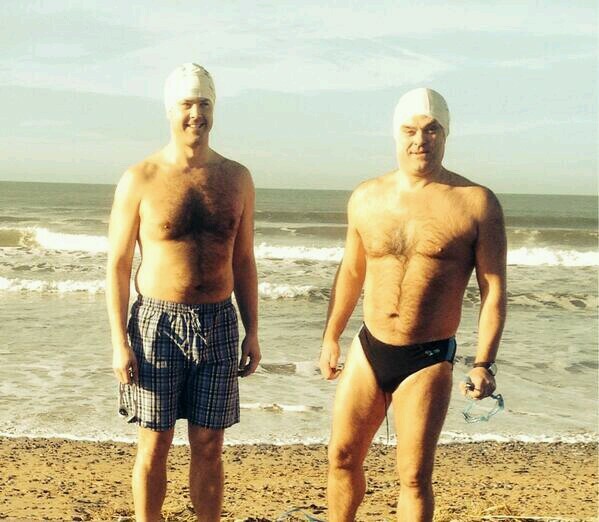 Also absent, on Gala duty in Tralee, a couple of Myrtlevillians couldn’t keep out of the sea. Fast Eddie Irwin, the surfer Dude & Bernard Lynch at Banna Beach today. Big waves in Kerry and I’m giving Eddie the benefit of the doubt by saying he was looking to catch some tubes in his board shorts. I couldn’t be saying he was swimming in his jox. If anyone’s interested, shorts available in Dunnes Stores pyjama department. Hat and goggles models own! Thanks, Eddie, saves me searching the web to source a pair for myself. Dey’re de berries, boy.